Located on the south east coast of Ibiza, Playa d’en Bossa holidays are full of lively activities, restaurants, and bars, as well as beautiful golden sands. Enjoy the best Ibiza has to offer, including beach bars dotted along the beach, crystal clear waters with plenty of sports to try, and cosmopolitan bars and restaurants. Just minutes away you’ll find quiet bays and pretty coves, small whitewashed fishing villages, and rolling hills with emerald forests. Day trips to Ibiza Town are perfect for history lovers wanting to immerse themselves in the culture on Playa d’en Bossa holidays. Here you’ll find an old town with historic city walls, cobbled streets and cathedrals, churches and other sights. Couples will love the lively buzz of the town, while families will find plenty on offer as well. At the beach you’ll find merry-go-rounds, trampolines, and bouncy castles, and there is also a water park just outside the town. Families with active older children can try scuba diving, kitesurfing, and jet skiing from the longest beach on the island. Luxury comes as standard in Ibiza, with Playa d’en Bossa offering a fantastic selection of amenities typical of the island. 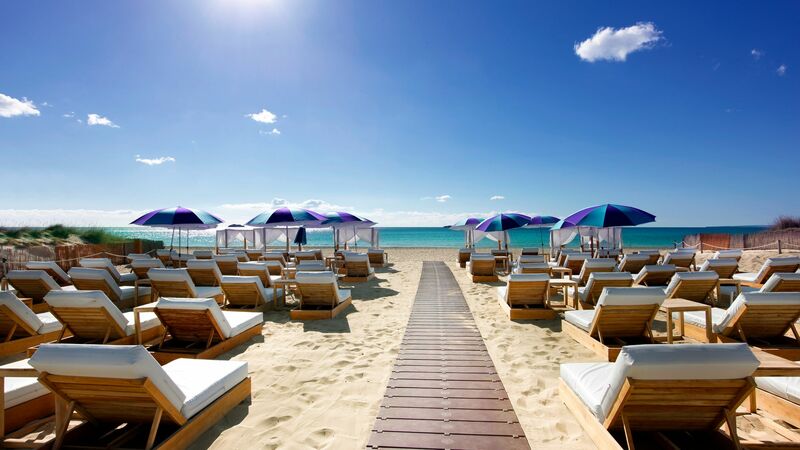 Spend your luxury Playa d’en Bossa holidays enjoying upmarket beach bars where you can listen to famous DJs or simply relax with a good book, as well as trendy bars and restaurants, and plenty of watersports. Indulge in some retail therapy at the designer outlets or chic boutiques before choosing from world famous restaurants. From sushi to Mediterranean, French or traditional Balearic cuisine, you can take your pick of some of Spain’s best and trendiest menus. At Sovereign we’ll help you plan your perfect luxury holiday in Playa d’en Bossa. Speak to one of our expert Trusted Advisers and they’ll get to know you before selecting one of our fantastic hotels. 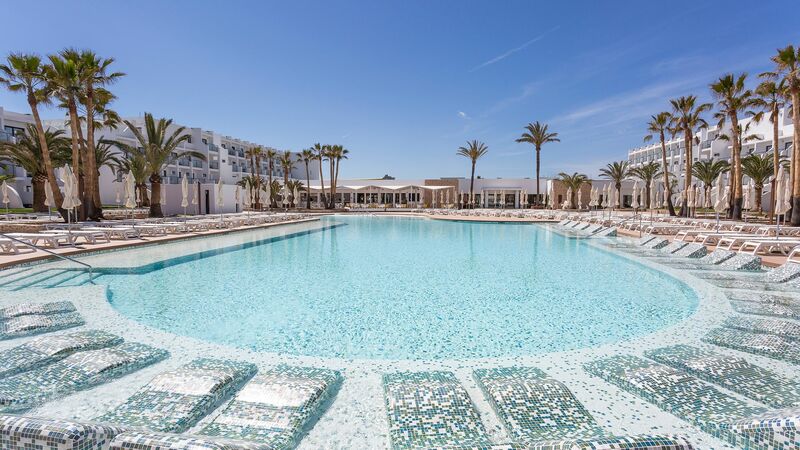 Grand Palladium Palace Ibiza Resort offers chic modern décor and a large swimming pool area, four restaurants, Kids’ Clubs and an extensive spa. 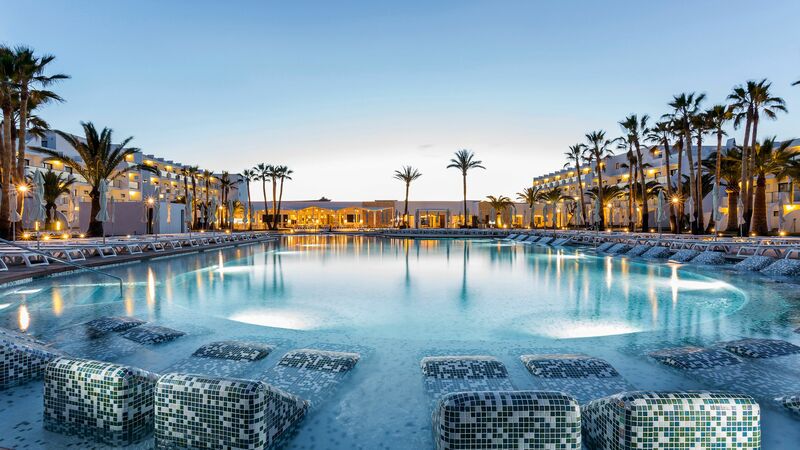 Alternatively, choose to stay at Hard Rock Hotel Ibiza and enjoy the many luxury amenities this fantastic brand is so well known for. Choose from delicious menus – from Ibizan specialities to American classics – relax in the spa or let your little ones try a variety of activities in the Kids’ Clubs. Flight time from the UK to Ibiza is around 2 hours 15 minutes. Transfer time from Ibiza airport to Playa d'en Bossa is approximately 10 minutes. Ibiza’s weather is classic Mediterranean, with warm, sunny summers and mild temperatures the rest of the year. May is when the holiday season kicks off in earnest, reaching the mid-20s and climbing towards 30°C for the hottest months of July and August.